Nathan P. Gilmour , 23 May 2011. I have read enough on the theory of translation (and attempted enough acts of translation myself) that I harbor few illusions about my ability to catch a translator obscuring something really important. I still get irritated when a translation of the Bible adds significant English nouns that do not correspond to anything in the Greek or Hebrew text (the NIV is especially bad about this), but even in those cases, I can usually see a good reason for such moves, and in those moments my response , usually, is to repeat my usual prayer that God never call me to make a new English translation of the Bible. So when I approached this week’s readings, and when I was looking at the Greek text after I’d read through the text in NRSV and NET English versions (I’m nowhere near strong enough in my ancient languages to make the Greek my primary text), I was surprised to see that both rendered the Greek noun pistin (which usually gets translated as “faith”) as “assurance” or “proof” in this verse. A quick check of the lexicon (I still have and use the big monster Danker that I purchased in seminary) told me that this was the only New Testament verse for which that connotation seemed to apply, and I had to pull hard on the reins to keep the translation-conspiracy part of my brain from charging forth into utter silliness. What saved me from such silliness was knowing a bit of Greek philosophy and remembering that Plato uses this word, pistis in the nominative case, to signify that realm of human statements that stands in contrast to gnosis or true knowledge. In other words, one more remarkable thing about Paul’s speech to the Athenians, beyond the citations of pagan poets that have impressed generations of missionaries and missional people and people who enjoy other cognates of the Latin missio, is the fact that, here, he anticipates the divisions that Athenian philosophy makes between different kinds of knowledge and locates the relationship between the Christian believer and the reality of God’s work in the realm of historical phenomenon rather than intellectual form, using the vocabulary of Plato’s divided-line allegory in order to make his point. 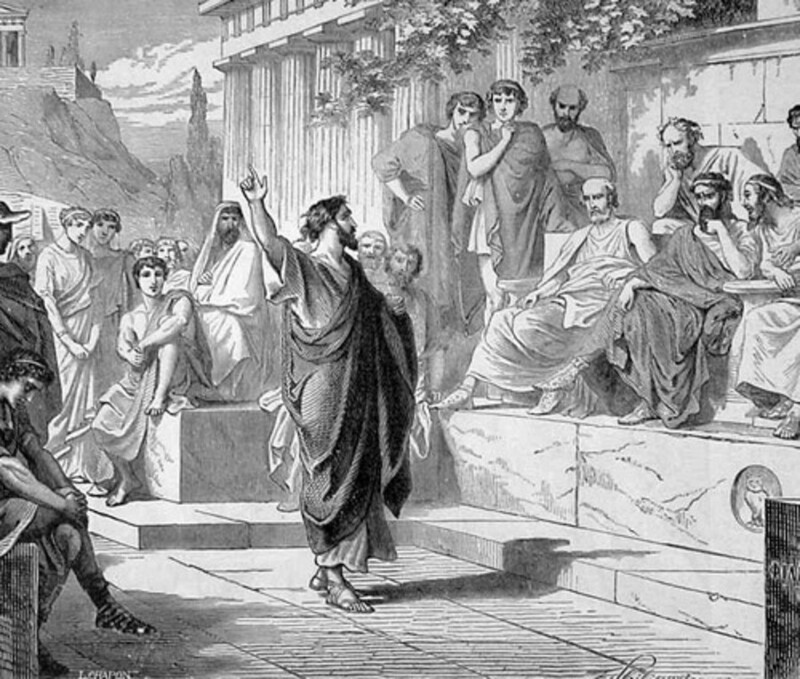 To put it another way, in a crowd of cultured Athenians, Paul is using not only logic (a known God can have known expectations, therefore worship of a God proclaimed supersedes sacrifice to the unknown god) and poetry (“in him we live and move and have our being”) but also the vocabulary of philosophical theories of knowledge in order to advance his point. The God whom Paul proclaims and the man (strange to see Paul name Jesus so generically, but there it is in the text) who brings that God’s judgment come clad in the idiom of Athens, and among those who do in fact repent is Dionysius, who until the Renaissance (whose troublesome practices of historical criticism saddled the books with the awful name “Pseudo-Dionysius”) was among the Church’s foremost Platonists. Certainly the Bible, for the Christian, is first and foremost Holy Scripture, good for instruction and correction and reproof and all those other book-of-Timothy things. But it’s also a grand story of how the God who first reveals God’s self to tribes of Palestinian farmers later stands astride the mighty Babylonian Empire and declares that the mighty city is just another town under the power of the Almighty. It’s also a book where the mighty Caesar Augustus is a mere footnote to the real action going on in the provinces, where legions not of Italians but of angels proclaim the birth of the true Lord and Savior. And it’s a book where the great literary traditions of Athens come together to provide Paul a medium for turning Plato on his head, telling the people who look for God so hard in the realms of the unknown that God has come to give not gnosin but pistin to all of the peoples of the world. In our own travels, may our proclamation stay true to the Son of the Most High even as the Christ takes on the garb of the city where we reside.